The classic Honda Valkyrie motorcycle is dressed up with Aeromach USA’s "V" Stacks for Valkyrie model years 1997 through 2003. Honda Valkyrie lobbied Aeromach for their "V" Stacks (aesthetic enhancing velocity stacks), which are now in production. Aeromach's "V" Stacks are aesthetically pleasing and do not alter the engine dynamics. Stacks mount using three stock phillips head screws, with dealer installation recommended. They are sold in a set of six. Each stack is machined from solid aluminum billet on computer-controlled CNC machines. 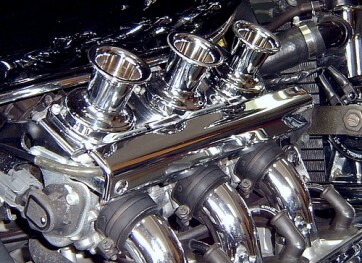 They then are finished in show-quality chrome. Aeromach's "V" Stacks are made in America by metal craftsmen. "V" Stacks and the entire line of Aeromach products can be seen at www.aeromach.net. Aeromach USA builds a line of quality chrome billet parts for v-twin and metric cruisers including Harley Davidson, Victory, Road Star, Royal Star, V Star, Vulcan Classic, Nomad, Drifter, Valkyrie, Aero, Ace, VTX, Intruder, 1500 LC and custom motorcycles. Biker Pros - We are a publicity company that increases brand awareness, leads and sales by executing targeted campaigns through publicity, social media, video and podcasts. We focus on enthusiasts industries including powersports, racing and motorcycles.